Climbing Ötztal | Climbers Paradise Tirol Climbing in Ötztal! Ötztal for rock enthusiasts means: climbing, climbing, climbing! No other valley in Tirol offers as many beautiful climbing areas and via ferratas next to eachother as Ötztal. The type of rock is granite. 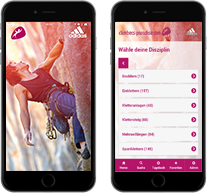 There are more than 600 routes in different climbing gardens in all difficulties for climbers of all levels. In the early 80s, Reinhard Schiestl opened up the first sport climbing route in the 9th grade. Both families with kids and seasoned climbers will find suitable routes. As there are too many climbing gardens, via ferratas and other outdoor aktivities to list them all, we recommend printing the topo of your preferred area already at home before you leave. Have fun climbing in Ötztal! Ötztal is 67km long and located in the middle of the Ötztal Alps. The eight villages Haiming, Sautens, Ötz, Umhausen, Längenfeld, Sölden, Vent and Obergurgl-Hochgurgl are characterised by the scenical diversity of the valley. Obergurgl-Hochgurgl is Austria’s highest inhabited village on an altitude level of 1.930m. Aqua Dome in Längenfeld is a thermal indoor and outdoor bath. It is recommendable for both kids to riot and grown-ups to relax. Experience the perfect holiday moment! There are four certified climbing gardens which are also convenient for families with children. They are very well maintained. One highly recommendable climbing garden ist for example Oberried close to Längenfeld, which has both picnic areas and toilets. Don’t forget to bring a change of clothes for your kids - the nearby creek is perfect for playing in the water. Engelswand in Tumpen is perfect for sport climbing in all difficulties. The access is very convenient and the climbing garden also offers several multi pitches. Visit the mountaineer village Vent. The village is located in the Ötztal Alps. Only 150 people live there – a big contrast to the touristy Sölden. The scenery is stunning as the village is surrounded by multiple mountain peaks over 3.000m. There is also a children’s playground with a water play park. Wild glacier rivers offer various opportunities for water sports from May until October: You can go rafting, canyoning, cayaking or canoeing. For more information, contact the tourism association Ötztal. ● Tirol’s highest waterfall, Stuibenfall, is located in Umhausen and is 159m high. ● Austria’s second highest mountain (3.772m), Wildspitze, is also located in Ötztal - a must do for all climbing enthusiasts. ● For people who love water, the lake Piburgersee close to Ötz is highly recommendable. With 23 degrees in summer, it is one of Tirol’s warmest lakes for bathing.